Does Magnesium Oxide or Magnesium & Oxygen Have More Energy? The human body can't use magnesium oxide, magnesium or oxygen to provide energy. While you do need oxygen to help you burn nutrients like proteins, carbohydrates and fats, it's the nutrients themselves that actually provide the energy. Outside of nutritional contexts, however, all chemicals have a certain amount of energy. In this regard, magnesium and oxygen have more energy individually than they do combined into magnesium oxide. Magnesium and oxygen are both elements on the periodic table. Magnesium is a metal -- it has a shiny, silvery color; conducts electricity; and is relatively soft. It's a fairly reactive metal and reacts readily with oxygen, among other things. Oxygen occurs most frequently in nature as O2, or oxygen gas. The gas is colorless and odorless, and it is an important part of Earth's atmosphere, of which it represents 21 percent. Magnesium oxide is a white powder that results when magnesium reacts with oxygen. It's a relatively common pharmaceutical chemical used to reduce symptoms of acid indigestion and constipation, notes PubMed Health. The compound forms when magnesium metal burns in the presence of oxygen -- it's literally possible to light magnesium metal on fire; this produces an intensely bright white flame as the magnesium reacts with atmospheric oxygen. The product is the white powder magnesium oxide, which looks like ash. When magnesium reacts with oxygen, the reaction releases a large amount of energy. The majority of this energy release occurs in two forms: as light and as heat. Because magnesium and oxygen release energy to form magnesium oxide, magnesium oxide has less chemical energy than magnesium and oxygen have. Reactions like this one that release energy are called exergonic reactions, notes Dr. Martin Silberberg in his book, “Chemistry: The Molecular Nature of Matter and Change." The reason that magnesium and oxygen have more energy than magnesium oxide is that while elemental oxygen, or O2, is relatively stable, magnesium is not. 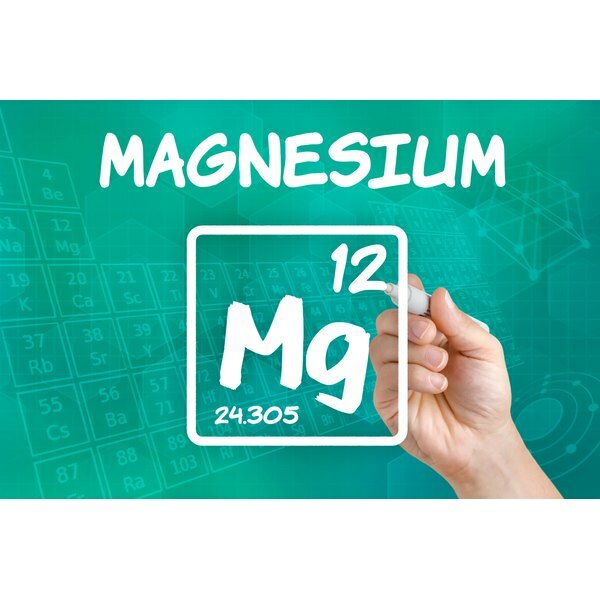 Magnesium has two electrons in its outermost electron shell; elements like magnesium are most stable with either eight electrons or none, in their outer shell. In reacting with oxygen, magnesium loses its two outermost electrons, making it much more stable and resulting in formation of the magnesium oxide compound. What Elements Are in Vitamins? What Are the Sources of Heat Energy? What are the Dangers of Infrared?